Don Goguen and Luc Jalbert, Co-Founders of Prelam Entperises Ltd. In 1999 two entrepreneurs, Luc Jalbert and Don Goguen, created Prelam Enterprises, an air freshener company based in Moncton, New Brunswick, Canada. It was the beginning of a real David and Goliath story. With a combined 40 years of entrepreneurial experience, the two businessmen succeeded in establishing their company with air fresheners such as Funky Monkey, Aromatherapy and Eclipse. But how could they make people talk about such a sensitive issue as foul personal odours left behind in toilets? How could a small company from the Maritimes and with only three employees ever compete with large air freshener giants, especially with something relatively unheard of on the air freshener market? Don and Luc wanted to prove to the world that it was possible for Prelam to develop its market and survive among all-powerful multi-nationals like S.C. Johnson and Proctor & Gamble. From TV commercials and newspaper advertisements to guerrilla and viral marketing, the Prelam team earned a reputation for consumer-driven innovation across Canada and the world. Just’a Drop is now sold in big box retail chains like WalMart, Loblaws and Shoppers Drug Mart. Just’a Drop not only became Prelam’s best seller in Canada, the toilet odour eliminator is also available in foreign countries such as the US, Japan, United Arab Emirates, Barbados, South Africa, Mexico and South America. 1. Just’a Drop Ostomy™ and Just’a Spray Advanced™ were specially developed for ostomates and can be poured in ostomy pouch as well as toilets. their top of the line formula are ideal for colostomy, ileostomy and urostomy instances. 2. Just’a spray™ bathroom odor eliminator forms a film on the surface of the water that traps and eliminates bathroom odors. With no harsh chemicals, your smelliest secret is safe thanks to our amazing blends of essential oils. 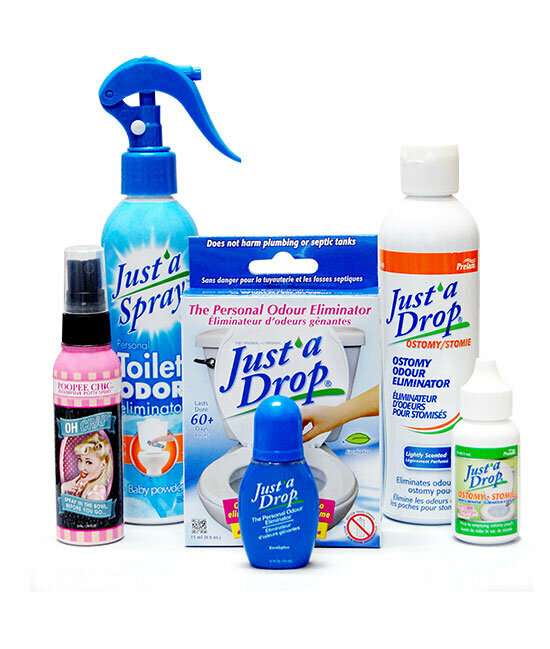 Just’a spray toilet odor eliminator is available in 220ml, 115ml, 55ml and 9ml sprays. 3. Pre-emptive Potty Spray Poopeechic™. The ultimate gift for people who have everything, including bad odors! With 10 hilarious collections ( for now…), Poopeechic Pre-emptive Potty Spray is sure to refresh everyone’s bathroom, be it your colleagues, partner, kids, roomates… even your boss! The company made its debut with a small 3000 square foot installation and three employees. Since then, Prelam has seen the number of its employees tripled with the creation of a production plant based in Moncton. Prelam continues its growth as its production system is currently being automatized in order to answer to the global demand.